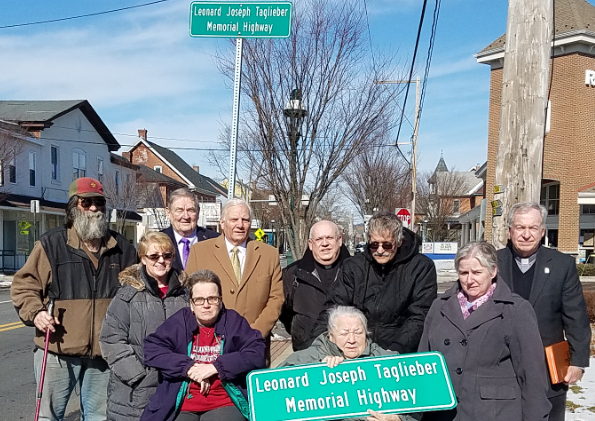 I was honored to join the sister and family of Lance Corporal Leonard Joseph Taglieber to unveil a stretch of Route 29 named in his honor. The stretch of Route 29 from this intersection to Tollgate Road in Upper Hanover Township is named in his honor. Marine Lance Corporal Taglieber, of East Greenville, died in 1967 from injuries sustained in the Vietnam War. I invite you to participate in my new online survey. Let me know what you think about: recreational marijuana, the minimum wage and Sunday hunting. Results will be sent to participants at the end of the survey period. Mobile Veterans Outreach Vans allow the Pennsylvania Department of Military and Veterans Affairs to reach deep into any community in Pennsylvania to provide personal, one-on-one assistance to veterans so they can learn about and apply for the benefits they have earned thanks to their service. The van takes people anywhere from shopping centers to county fairs. In 2018, the vans traveled to 107 events across the state and DMVA staff interacted with more than 1,500 veterans. DMVA’s outreach staff coordinates each event with county directors of veterans affairs, veteran service organizations and local and state officials to maximize publicity and attendance. You can request a van for a community event and to find out where the vans will be here. Pennsylvanians may download forms to file 2018 personal income taxes in the traditional manner prior to the Monday, April 15, 2019 midnight deadline. For electronic filers, Padirectfile is available for state-only personal income tax or PA Free File is a no-charge option to file federal and state taxes at the same time. **My office provides both state and federal tax forms at both my district offices. Individuals with qualifying disabilities and their families may save for a wide range of disability-related expenses through state-offered savings and investment options authorized under the Pennsylvania Achieving a Better Life Experience program (PA ABLE). 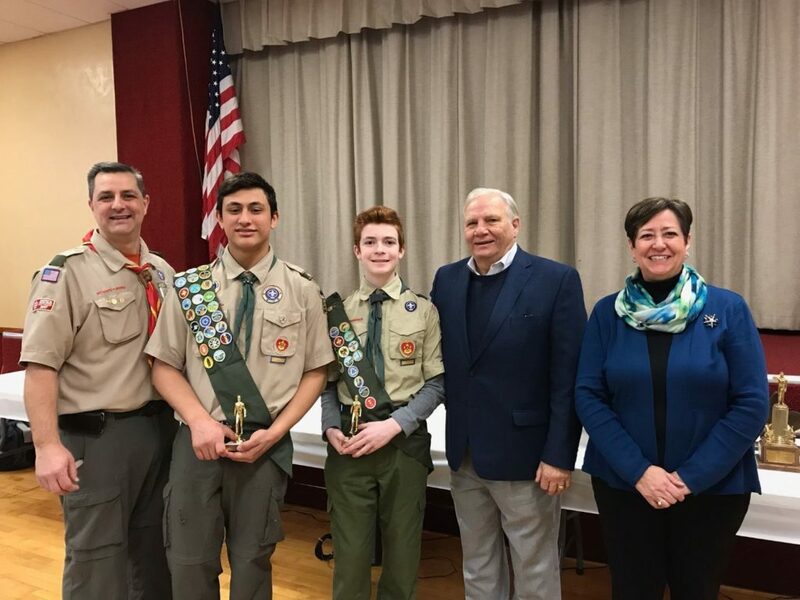 I enjoyed attending Boy Scout Troop 105’s breakfast end with PA State Rep. Marcy Toepel. Removing snow and ice from the hood and roof of your vehicle is more than a good idea – it is the law, according to the Pennsylvania State Police. State Police reminds drivers that lights must be turned on any time the vehicle’s windshield wipers are in continuous or intermittent use due to rain, snow, sleet, or mist. The Pennsylvania Office of the State Fire Commissioner warns that wood stoves and fireplaces are responsible for 36 percent of home heating fires. Keep your family safe this winter with these home fire safety tips. 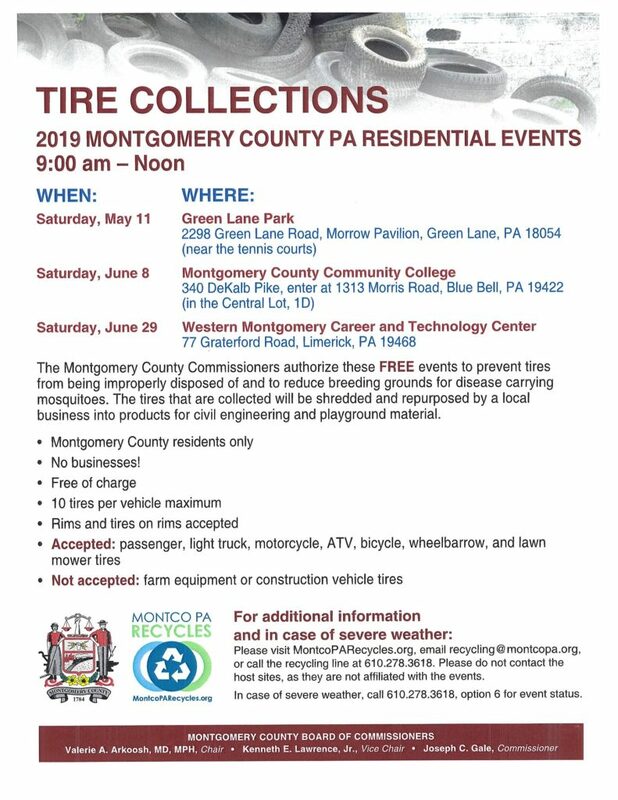 Montgomery County Commissioners have authorized free events to collect old tires. This prevents tires from being improperly disposed of and to reduce breeding grounds for disease carrying mosquitoes. The tires that are collected will be shredded and repurposed by a local business into products for civil engineering and playground materials. These events are for Montgomery County residents only, businesses are not allowed to use this service. There is a 10 tire maximum per vehicle, rims and tires on rims are accepted. The types of tires accepted are passenger, light truck, motorcycle, ATV, bicycle, wheelbarrow, and lawn mowers. What is not accepted is farm equipment or construction vehicles tires. For additional information visit www.MontcoPARecycles.org, email recycling@motcopa.org, or call the recycling line at 610-278-3618. 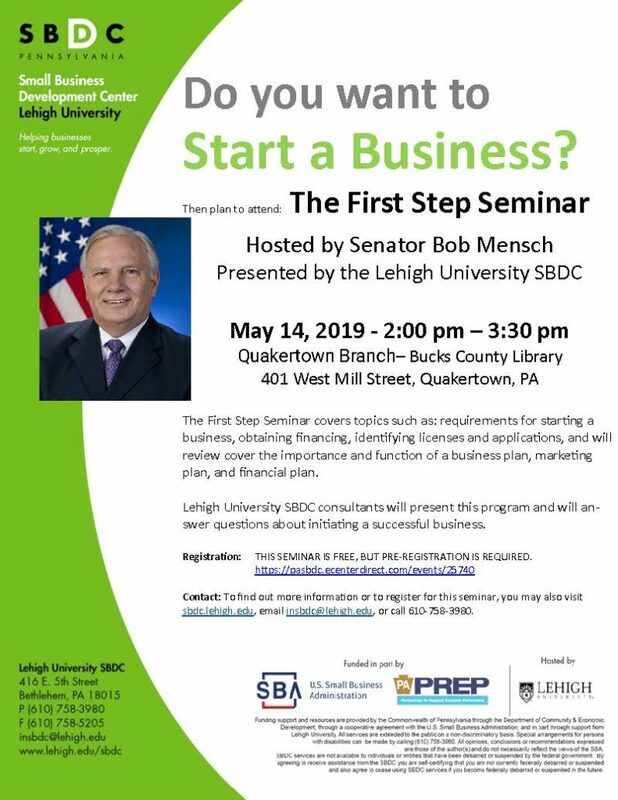 Come to my First Step Seminar on May 14 from 2 p.m. to 3:30 p.m. at the Quakertown Branch-Bucks County Library, 401 West Mill Street in Quakertown. This free seminar will cover topics such as: requirements for starting a business, obtaining financing, identifying licenses and applications, and also will review the importance and function of a business plan, marketing plan and financial plan. 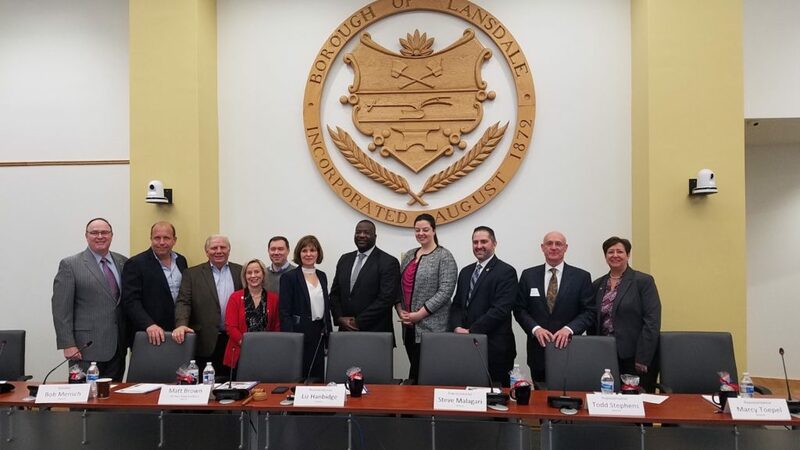 The recent Chamber of Commerce for Greater Montgomery County’s legislative event was informative and I enjoyed taking part. February 11th was PA 2-1-1 Day, a day to celebrate the 2-1-1 service available to Pennsylvanians to assist them with their health and human service needs. The PA 2-1-1 system is a free, confidential dialing code. Through 2-1-1 people connect to a wide range of services from disaster relief to utility assistance, senior citizen programs, emergency food, job counseling, youth programs and much more. It is the one-stop-shop for services available in communities across Pennsylvania. To learn more about the PA 2-1-1 system, please visit www.uwp.org/what-2-1-1.